Dispense soap directly from your kitchen sink with the Moen Traditional Deck Mounted Soap and Lotion Dispenser. This built-in soap dispenser offers a clog-resistant pump and elegant gooseneck spout for generous reach, and refills easily from the countertop. The deck-mounted dispenser requires only one hole for installation and includes a refillable 18-ounce bottle. 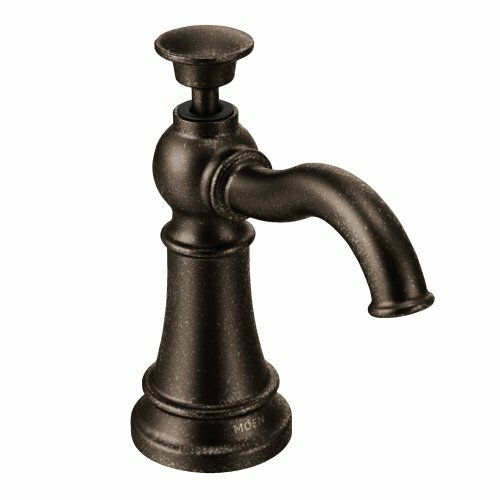 The dispenser’s oil rubbed bronze finish brings the warm look of old world charm to your kitchen. It is backed by Moen's Limited Lifetime Warranty.